Retired Air Force Master Sgt. 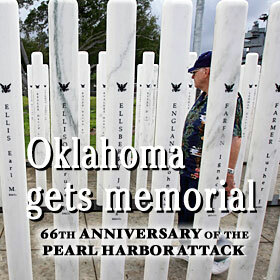 Sterling Kirby walked yesterday among the marble pillars bearing the names of the 429 who died aboard the battleship USS Oklahoma. Officials are assessing damage after a flash flood in Kula and electrical and water failures throughout the island. UH reserved twice the number of Sugar Bowl tickets than the UGA. The companies said they are in talks to sell stores in unspecified "key markets." Motorists are warned to expect delays, as East Oahu roads will be closed for the race. A tennis exercise is less about precision and more about boosting heart rates. In spite of the freezing temperature, Colt Brennan got a warm reception in NYC. The 27,000-some marathon participants don't seem overly concerned the weather may be less than ideal. USAA Insurance and State Farm Insurance came out best in a state tally of complaints by auto insurance consumers. It is now going to cost at least $44 one way to travel between islands on the state's two largest airlines. A procedural vote in the Senate has stalled a sweeping energy bill approved by the House.